I love holding yarn and imagining the fabric it can become. 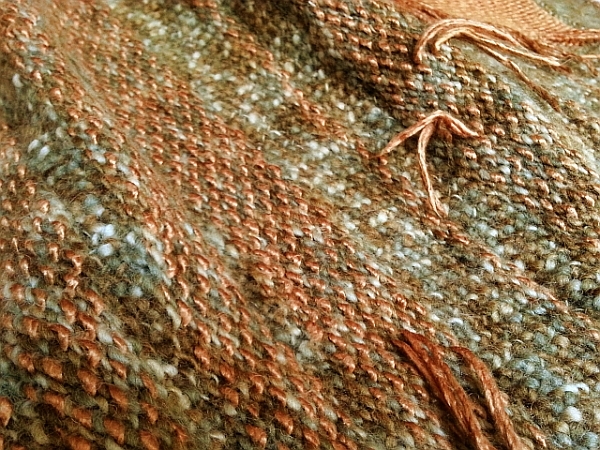 I'd been holding these yarns for a long time, on and off for years actually -- a variegated merino wool, green (ranging from pale to a warm olive) and a lovely copper-colored silk. Sadly, my sources for these yarns are no longer available. Happily, it meant I could use the yarns to make myself a special fabric. So I knitted a wool jersey, a fancy jersey, with tucks, and I used the reverse side as the public side. The silk yarn became an inlay ("knit-weave" for the any Japanese-style machine knitters reading this) in places totally improvised, and I left a few loose ends. The solid copper patch you see in the upper right corner of the photo below is a reverse jersey of pure silk. I used the fabric sideways, that is, the selvage is parallel to the floor. I'm assuming the unstretchy silk yarn inlay will keep the fabric from "growing" during wear. We'll see. 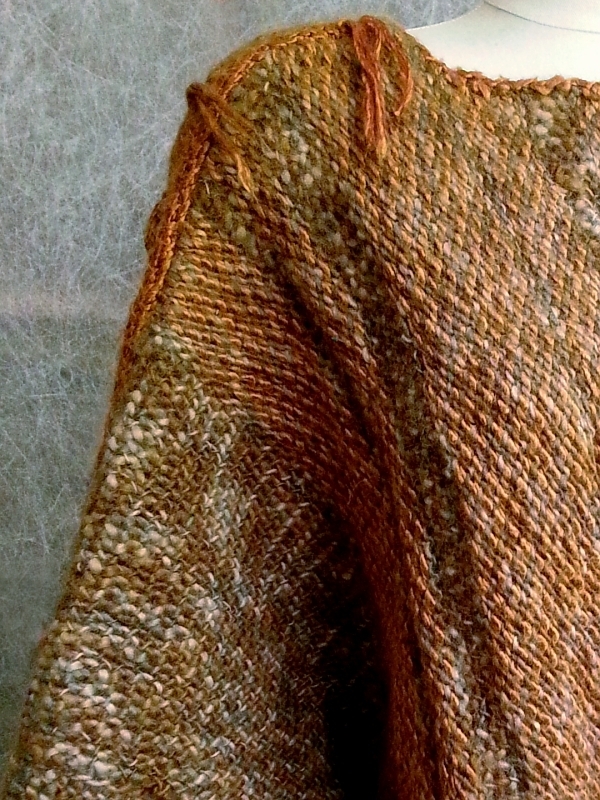 The finished garment is both rustic and sophisticated. The shape is asymmetrical. And it's luxuriously soft. Once I figure out exactly how I'm styling this, and when I'm ready to dress in very warm wool, I'll model it and take pics. In the meantime, here's a sneak peek.